Advertiser.ie - Did a midsummer murder silence a guilty pilot? In June 1858 Galway town was in a fever of excitement. Its vision for a magnificent transatlantic port off Furbo, reaching deep into in Galway Bay, where passangers from Britain, and throughout the island of Ireland, would be brought to their emigration ship in the comfort of a train, could now be scuppered by the apparent carelessness of the two local pilots. 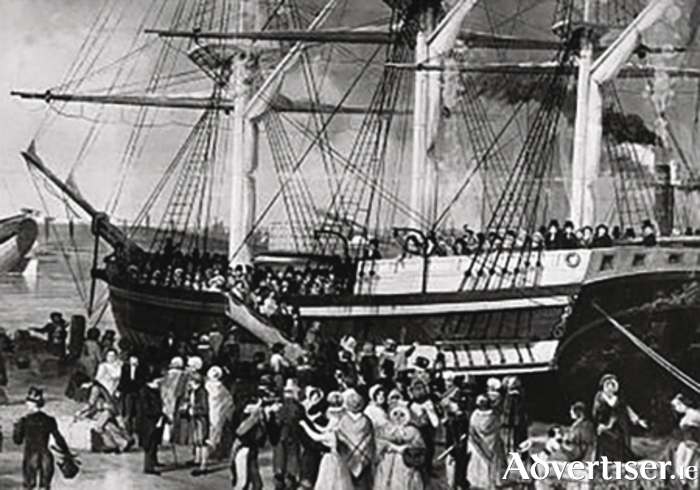 The mid 19th century saw emigration to America on a massive scale. During the Great Famine landlords looking to evict penniless Irish tenants would pay to have them shipped to America. In many cases these ships were poorly built, crowded, disease-ridden, and short of food, supplies and medical services. But as the century moved on, the people traffic to America grew rapidly. People had money to pay their passage, and ships were increasingly better built and well supplied. However, crossing the Atlantic was an arduous and at times, a dangerous undertaking. What everyone wanted, was a calm, safe, and easy journey. The Galway plan was to make that journey as comfortable, and as trouble-free as possible. The entrepreneur John Orrell Lever agreed to lease three state-of-the-art steam-sailing ships to launch the Galway project. On a midsummer’s evening, June 16 1858, the first of Lever’s ships, the Indian Empire, sailed majestically into Galway Bay with 86 hands. It took on board two local pilots, Henry Burbridge and Patrick Wallace, to guide them into the harbour. To everyone’s shock and horror, the pilots (whether intentionally or not ), rammed her on to the Margaretta Rock*, the only rock in the bay, and possibly the best known danger point in the vicinity. It was a disaster for the Galway transatlantic plan. It appeared that it had become a cropper on its inaugural voyage. In fact the ship was easily refloated in high tide, but when the Indian Empire came into Galway port (the Furbo harbour was never built ), the pilots were summoned to a special meeting of the Harbour Board. A furious crowd jeered Patrick Wallace to such an extent that he had to take refuge in the police station. Local newspapers printed, what everyone believed, that the pilots were bribed to wreck the ship, by the Liverpool merchants, afraid that Galway would steal their British monopoly of the American route. While there was no evidence of anyone in Liverpool bribing the two unfortunate men to ram the Indian Empire, the whole town assumed that Liverpool was to blame. Captain Courteney, the first of four prosecution witnesses, blamed the pilots. He said that if he had not reduced the ship’s speed after entering the bay, she ‘would have broken her back and become a total wreck’ when she hit the rock. The prisoners were taken over the Salmon Weir Bridge to prison escorted by a large body of armed policemen to protect them ‘from the infuriated violence of the populace’. Lever, however, was more circumspect. He offered £200 to either of the pilots, now in prison, if they confessed, and told the names of those who bribed them. Then further shock horror! One of the pilots Partick Wallace suddenly died. During the inquest that followed on July 24, no fewer that three doctors said the poor man had been poisoned. Now all hell broke lose. There was consternation throughout the town. Had Wallace been poisoned by some Liverpool scoundrel to stop him talking? Or had he committed suicide? Nobody knew. But Fr Daly put together a high-powered delegation from among Galway’s great and good, and set out for London to see the British prime minister, Lord Derby. He needed to explain Galway’s case for the transatlantic harbour, to scotch any rumours that the prime minister might have heard; and to ask for the money to build the harbour, and to extend the railway. Next week: More on Fr Peter Daly, and a bemused Lord Derby. NOTES: Dónall Ó Luanaigh reminds me that a Limerick Stemaship Line vessel, the Moyalla, was wrecked on or near the Marguerite (Margaretta? ) Rock c.1946-1947. There was a buoy near the rock which emitted a moaning sound which could be heard on the prom in a south wind. ‘Old Galwegians called this sound ‘Campbell’s (pronounced ‘Camel’s’ ) Calf. Mr Campbell had been secretary of the Harbour Commissioners’. I am taking the above story from Ray Burke’s excellent Joyce County-Galway and James Joyce, published by Currach Press, on sale €19.99. Joyce twice visited Galway in 1909 and 1912. Ray Burke’s book is full of surprises. It details the influences that Galway, its people and stories, had on Joyce, and how they intriguingly reappear in his writings.